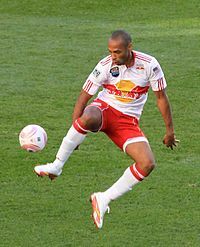 ^ "New York Red Bulls sign international star Thierry Henry". New York Red Bulls. (2010年7月13日) 2010年7月15日閲覧. ^ "Standings". Major League Soccer. 2011年12月26日閲覧. ^ "Earthquakes advance". ESPN Soccernet. (2010年11月5日) 2014年2月23日. ^ "2011 MLS Standings & Leaders" Archived 2012-01-13 at the Wayback Machine.. Major League Soccer. 2011年12月27日閲覧. ^ 2011 MLS Cup "Playoffs" Archived 2011-11-20 at the Wayback Machine.. Major League Soccer. 2011年12月26日閲覧. 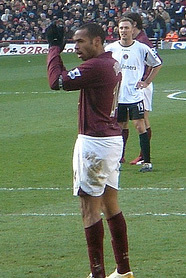 ^ "Thierry Henry joins Arsenal from New York Red Bulls". BBC Sport. (2012年1月6日) 2012年1月6日閲覧. ^ McNulty, Phil (2012年1月9日) "Arsenal 1–0 Leeds". BBC Sport. 2012年1月10日閲覧. ^ "Henry records hat trick as Red Bulls top Impact" Archived 2012-04-03 at the Wayback Machine. Major League Soccer. 2012年4月3日閲覧.